A demonstration for hip pain and massage therapy/movement treatments for runners or general public in Flagstaff, Arizona. Geoffrey Bishop of Stay Tuned Therapeutics demonstrates. Celebrate Earth Day! Book a massage, facial, waxing, or any treatment we offer during the week of Earth Day, March 19-24th, and receive 20% off when you bring in your used electronics at appointment time to Stay Tuned Therapeutics. Call now to book your appointment, receive the discount when you come in, it’s that simple. Items will be donated, recycled or disposed of properly. Call Geoffrey at 928-699-1999 or Missy at 928-699-1801 for details! Thank you all who have joined the Stay Tuned Therapeutics ‘fan’ page. Feel free to use this page as one way to interact with Missy and Geoffrey. Questions, comments, interesting ideas, product or service suggestions, we are here for you. Take a peak at our videos, which we will be updating soon, articles, blogs, other blog, other blog. I’d like to give you some background about Missy and Geoffrey. Geoffrey graduated massage school in 1997 at East West College of Healing Arts, in Portland ,OR. Missy graduated aesthetician school in 1997 at Rob Roy Academy, in Worcester, MA. Missy and Geoffrey met at The Black Diamond Spa in Flagstaff, AZ in 2000. Geoffrey left the spa in 2002 to pursue a more liberating career being self employed, opening shop under the same name he created in massage school business class, Stay Tuned Therapeutic Massage & Bodywork. With the intent of working with athletes, musicians, and all folks who need to…Stay Tuned. Geoffrey has enjoyed working with visiting international athletes from all endurance sports, and specializes in massage for special needs clients and specific pain management. In 2005 Missy also quit the spa, for the same reasons, to custom tailor treatments, and explore self employment. Missy enrolled in massage school at Phoenix Therapeutic Massage College and graduated in 2006. Joining Stay Tuned, we changed the name to ‘Therapeutics’. They have had a successful business ever since. Their practice is in a wonderful old house, built in 1905 in Flagstaff, AZ. Custom treatment include massage therapy for specific conditions, general relaxation and stress management, Myoskeletal Alignment, sports massage, customized facials to fit your skin’s needs and nail care. Geoffrey and Missy are both Certified Advanced Myoskeletal Therapists, state licensed, and Nationally Certified. Thanks for sharing a bit of your time with us, feel free to give us a call, comment on any of our pages, blogs, etc. Have a great day and ……Stay Tuned! Erik Dalton’s Myoskeletal Alignment Techniques are partly based on the reflexogenic relationship between muscles and joints. By releasing ‘tight’ deep 4th layer muscles, Myoskeletal Therapists help open ‘stuck’, or ‘out’ joint spaces, reducing irritation in the articular receptors, chemo receptors, and nociceptors. 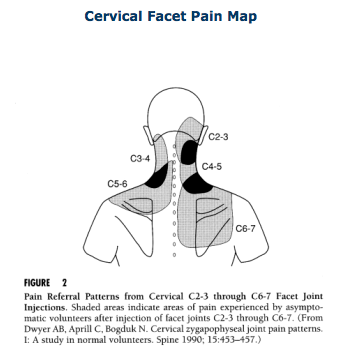 Specific joint positions are reached and some type of activator, client movement, is used to release spasm, and the cycle of movement/pain reduction/movement begins. 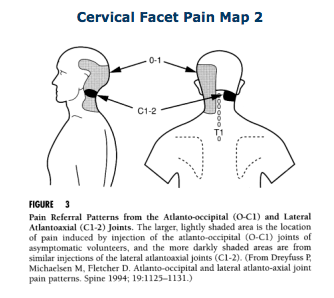 The charts below demonstrate the pain patterns that are produced by cervical facet joint dysfunction. Having been a massage therapist for 13 years now I have never had an injury to my arms, wrists or hands. You can use these simple exercises to ensure a long life in whatever job you have that requires extensive use of the hands and forearms. Take computing for instance, there is no other way you found this information, how many hours a day do you spend on the keyboard, the mouse, or just hunched over in that nice chair? Now, how many minutes a day do you spend providing regeneration to the injured/over used tissue. Now, what is your plan for pain free longevity in this position you so love? You may be the type of person who just prefers having a massage to treat aches and pains, great, I’ll take your money. However, do you realize that hard earned money you invest in therapy will go so much further if you take some responsibility? Take 5 minutes and follow me through on these exercises, if you need a band contact me and you can stop by, or I will ship one. Traditionally, the benefits of steaming include increased energy, decreased incidence of infections, and fewer colds and flus. Many regular steam or sauna bathers have experienced that a good long sweat bath at the early onset of a cold or flu can help ward off the disease before it manifests as actual symptoms. The heat from a Steamy Wonder™ treatment raises your core body temperature, inducing an artificial fever. During a fever, the production of white blood cells is increased, as is the rate of their release into the blood stream. White blood cells are the primary agents of the immune system. As the generation of antibodies speeds up, so does the production of interferon, an anti-viral protein. In this manner, your body’s immune system is strengthened as it works to combat the fever. At the same time, sweating helps eliminate toxins and waste products from the body. After detoxification, your immune system has less “housecleaning” to do and can focus on protecting your body from more serious health threats. produced by sweating, overall health and resistance to diseases is increased. Mayo Clinic researcher, Dr. Wakim, cites findings that the number of white blood cells increased by an average of 58% during an artificially induced fever.